(NBC New York) – Newt Gingrich’s long resume just got longer. The former presidential candidate, House speaker and political consultant is now also a tech reviewer for Mashable. His first post, a review of the Apple Watch, hit the site today, saying while there are some hiccups with the wearable gadget, it’s a step in the right direction and fun for many people. The idea to have him write for the site arose on Twitter two years ago, after Gingrich tweeted about virtual cars. A then-Mashable employee tweeted back, saying he wished the Republican would review the car for the site. While that review never happened, the prolific writer and technology fan later gave the site another reason to ask. In May 2015, he wrote a post for his own website about the virtual reality headset Oculus Rift. Mashable again took to Twitter to hint at the idea of him writing for the site. 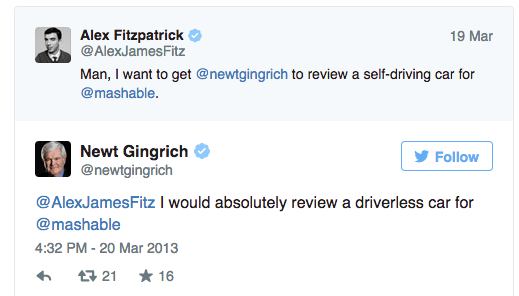 With an excited response from Gingrich, a plan was set: he would be reviewing the Apple Watch. The 1,000-plus word review, which covered use of the watch during a cross-country flight and managing a busy schedule, got more than 1,000 shares within hours of hitting the Web. And the cub Mashable reporter seemed to be enjoying the job, too.